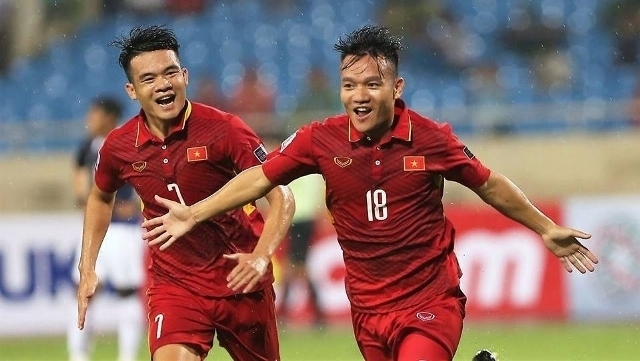 The door is wide open for Vietnam to the 2019 Asian Cup finals as the team trounced Cambodia 5-0 during their clash under the 2019 Asian Football Confederation (AFC) Asian Cup qualification in Hanoi on October 10th. 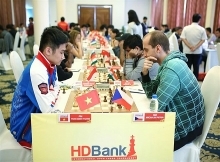 The clash at My Dinh was not in a favourable weather as it was raining heavily and influenced the match’s quality. However, Vietnam, with best-form lineups, quickly took home advantage to strengthen attacks on their guests. The opener arrived soon for the hosts in a rather lucky manner in the 12th minute as Dinh Thanh Trung’s kick hit a Cambodian defender and deflected into the goal, which keeper Sou Yaty was unable to save. 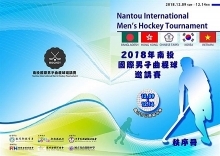 Vietnam continued to overwhelm and created consecutive threats to Sou Yaty’s goal. However, due to the heavy rain and slippery ground, Vietnamese players could not convert any opportunities into goals during the last minutes of the first half. In the 56th minute, a skilled cross of Thanh Trung found Van Quyet and Vietnam’s captain punished the Cambodian defensive line with a superb header, doubling the scoring for Vietnam. 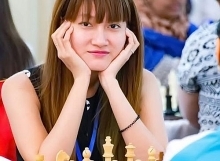 The 2-0 lead helped Vietnamese players to alleviate the pressure and play more confidently. The team only needed four minutes to score the third goal by veteran striker Anh Duc. The goals by strikers Van Quyet and Anh Duc inspired Cong Phuong, the remaining spearhead on Vietnamese trio attack line, to find his goal. 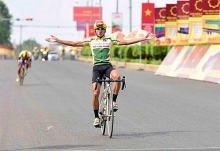 However, the Hoang Anh Gia Lai striker had to wait until the 76th minute, after many opportunities missed, to celebrate with the fourth goal for Vietnam. In the remainder of the match, Cambodia advanced to find their goal. However, all they could do was simply stop at a free kick hitting the post from Bin Chanthacheary in the 87th minute. Not only that but, Cambodia also conceded a goal in the crucial time as the substitute Mac Hong Quan made it 5-0 for Vietnam. The 5-0 win helps Vietnam earn eight points, on par with Jordan, but still temporarily rank behind the group leaders for a lower goal difference. The victory yet helps Vietnam set a foot in the 2019 Asian Cup finals and is also a farewell gift to interim Coach Mai Duc Chung, who will transfer his management position to new Korean Head Coach Park Hang Seo after the match.